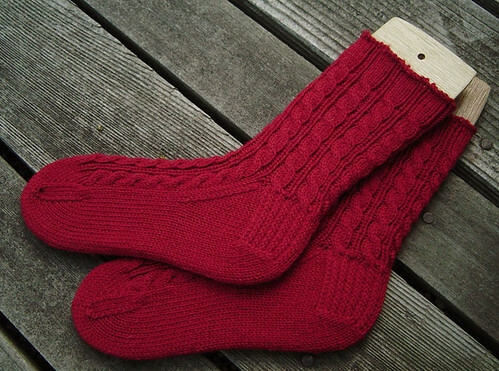 No sooner do I post a finished pair of Virginia’s socks when I see another pair off the needles and blocking. And, since the blogging police are insisting we disclose all information pertaining to our projects, the above socks were also knit using Meilenweit (this pair, the 6-ply sock yarn). The pattern is one of Virginia’s creations. She knit them on size 2.5US needles (double points). Let’s see… the photo was taken on our deck at about 3 p.m. on Sunday afternoon. Air temperature was a perfect 68˚F (actually a little cool in the breeze, but nice, nonetheless). Anything else? Back from an extended absence, I’ve managed to finish 8 oz. 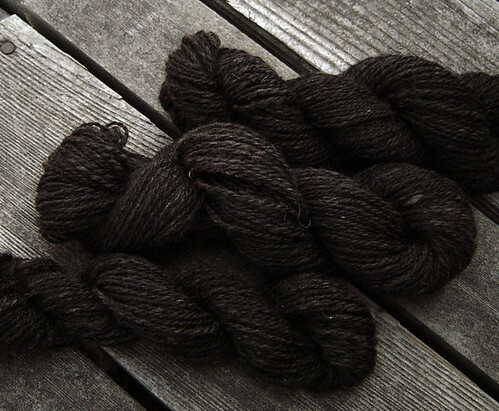 of dark Icelandic roving (it’s from the lamb, so it’s nice and soft). I picked this up last year from Riverwinds Farm, who had a booth at Shepherd’s Harvest. They do such a great job in preparing their fiber. I look forward to buying from them every year. There are a total of 394 yards of 2-ply yarn. The wheel is all clear now, so I have the exciting activity of picking out what to spin tonight! Hope the weather in your neck of the woods is a great as it is here. ETA: In case you haven’t figured it out, the photos are now bigger. So, you can click them to see a larger version… you know, for more detail. Beautiful as always! Keep churning out those gorgeous knits, they’re inspirational to slow knitters like myself. Out of curiosity, Virginia, do you knit continental, irish cottage? How fast can you knit?! Hehehehe well done, grasshopper. Love the socks, V! I shall have to try this “mielenweit”. It’s gorgeous! Great stitch definition. The icelandic looks nice and squooshy. Very pretty! Just a note to say I’m glad I found you again! I got here via a link on Ravelry because I wanted to read more about Ginni’s Geno cardigan. I should have known by the number of socks being cranked out that this is the new Spin/Knit. Keep up the crafting and all else that you do! It’s most inspiring.